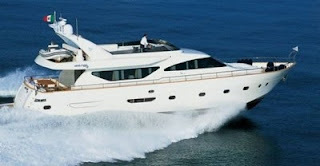 Luxury Yacht Charter Alalunga 78 RIVIERA is available for FIFA 2010 with waived deliveries. Riviera launched in August 2009, this new 78 Alalunga has interior design completely revolutionized by the young designer Alessandro Vescia. Its engine with a pair of Caterpillar C32 1825 hp can reach a speed of 36 knots. This confirms the good characteristics of marine hull that has always characterized the Alalunga yachts. Alalunga 78 RIVIERA is available for FIFA 2010 with waived deliveries. Charter fee Euro Euro 6.000+ VAT 8% per day for a minimum of 5 days or Euro 39.000+ VAT 8% per week. Berth fees and expenses not included. Max 25 guests for parties.